Many happy Mirkwood Designs templates users have asked how they can help support my Web site. You can securely use your PayPal account or any major credit card. If you cannot make a monetary donation, I would appreciate your prayers. I thank you for your consideration, and may God bless you! If you are not comfortable donating online, please click here for my snailmail address. NOTE: Would the person who sent me a lovely sample image of this card (used as a tag on a basket) please resend it? ***Please send it to this email address instead:*** ruthann.zaroff@gmail.com. I managed to delete your email before I saved the image! THANKS! Note: The card above was made using a slightly different template, which I will add to my site when I get a chance. 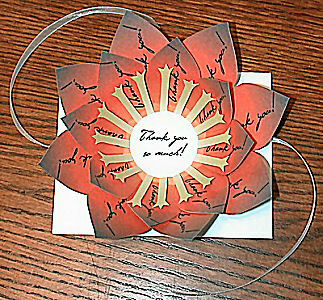 The flower card you make with the template below is made the same way, and looks equally great! CLICK HERE FOR PART 1 OF THE FLOWER CARD TEMPLATE. CLICK HERE FOR PART 2 OF THE FLOWER CARD TEMPLATE. This template makes a stunning 3-dimensional flower card, perfect for spring or summer! Print the template onto card stock. The template consists of three petal pieces and one circle center piece. Cut each of the four pieces out carefully, making sure to cut inside the lines so they don't show in your finished card. Write your greeting on the circle center piece. Center the four pieces carefully, one on top of the other, and glue in place (largest on bottom, circle on top). Beginning with the smallest petal piece, fold the petals inward overlapping the petals in a spiral. Continue with the middle petal piece and finally the largest petal piece. If desired, glue a piece of ribbon on the back of the flower and bring the ends around and tie in a bow to keep the petals closed until you give the card away. 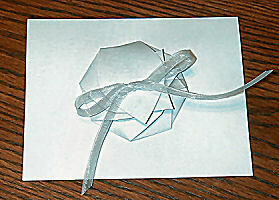 You can glue the completed flower onto the outside of a card or give just as it is. These templates are free for your use to make craft items to give or sell, to use for teaching purposes, or for submitting projects to magazines. I would appreciate it if you provide a link to my Web site. The templates themselves may NOT be auctioned, sold, or published in any way without my permission.